The body is like a machine that needs to be supplied with the right kind and amount of fuel. This may refer to nutrition or the food requirements of a person or patient. Adequate nutrition is essential to meet the body’s demands. Several diseases can greatly affect the nutritional status of an individual, this includes gastrointestinal malabsorption, burns, cancer; physical factors (e.g., muscle weakness, poor dentition, activity intolerance, p[ain, substance abuse); social factors (e.g., economic status, financial constraint); psychological factors (e.g., boredom, dementia, depression). In certain conditions such as trauma, sepsis, surgery, and burns, adequate nutrition is vital to healing and recovery. Also, religious and cultural factors greatly influence the food habits of patients. Imbalanced Nutrition: Less Than Body Requirements in women exhibit a higher incidence regarding voluntary restriction of food intake secondary to anorexia, bulimia, and self-constructed fad dieting. A pregnant woman who has eating problems may also have problems like fetal growth restriction. Older patients who have cognitive impairments and encounter financial limitations have higher chances of eating problems. This includes negligence, physical limitations, deterioration of their senses, reduction of gastric secretion, poor digestion, and social isolation and boredom that cause lack of interest in eating. The following are the common goals and expected outcomes for Imbalanced Nutrition: Less Than Body Requirements. Patient presents understanding of significance of nutrition to healing process and general health. Patient or caregiver verbalizes and demonstrates selection of foods or meals that will accomplish a termination of weight loss. Patient demonstrates behaviors, lifestyle changes to recover and/or keep appropriate weight. Patient displays nutritional ingestion sufficient to meet metabolic needs as manifested by stable weight or muscle-mass measurements, positive nitrogen balance, tissue regeneration and exhibits improved energy level. Patient shows no signs of malnutrition. Patient takes adequate amount of calories or nutrients. Patient maintains weight or displays weight gain on the way to preferred goal, with normalization of laboratory values. Patient weighs within 10% of ideal body weight (IBW). 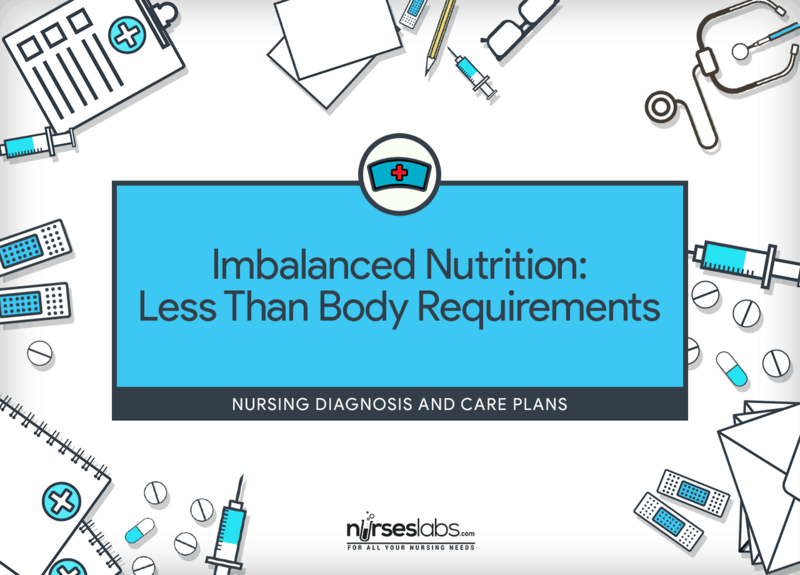 Routine assessment is needed in order to identify potential problems that may have lead to Imbalanced Nutrition: Less Than Body Requirements as well as name any circumstance that may transpire during nursing care. Note real, exact weight; do not estimate. These anthropomorphic assessments are vital that they need to be accurate. These will be used as basis for caloric and nutrient requirements. Take a nutritional history with the participation of significant others. Family members may provide more accurate details on the patient’s eating habits, especially if patient has altered perception. Ascertain etiological factors for decreased nutritional intake. Several factors may affect the patient’s nutritional intake, so it is vital to assess properly. Patients with dentition problems need referral to a dentist, whereas patients with memory losses may need service like Meals on Wheels. Other medications also have an effect on the appetite of the patient. Review laboratory values that indicate well-being or deterioration. Laboratory tests play a significant part in determining the patient’s nutritional status. An abnormal value in a single diagnostic study may have many possible causes. This determines degree of protein reduction (2.5 g/dl signifies severe diminution; 3.8 to 4.5 g/dl is normal). This is vital for iron transfer and typically decreases as serum protein decreases. These counts are frequently dropped in malnutrition, revealing anemia, and reduced resistance to infection. Potassium is typically elevated, and sodium is typically lowered in malnutrition. Look for physical signs of poor nutritional intake. The patient encountering nutritional deficiencies may resemble to be sluggish and fatigued. Other manifestations include decreased attention span, confused, pale and dry skin, subcutaneous tissue loss, dull and brittle hair, and red, swollen tongue and mucous membranes. Vital signs may show tachycardia and elevated BP. Paresthesias may also be present. Note the patient’s perspective and feeling toward eating and food. Various psychological, psychosocial, religious, and cultural factors determine the type, amount, and appropriateness of food utilized. Evaluate the environment in which eating happens. Most adults find themselves “eating on the run” or relying massively on fast foods with lower nutritional components. Older people living independently may not have the drive to prepare a meal for themselves. Link usual food intake to USDA Food Pyramid, noting slighted or omitted food groups. The Food Guide Pyramid emphasizes the importance of balanced eating. Omission of entire food groups increases risk of deficiencies. Assess patient’s ability to obtain and use essential nutrients. Several factors may affect the patient’s nutritional intake, so it is necessary to assess accurately. Cases of vitamin D deficiency rickets have been reported among dark-skinned infants and toddlers who were exclusively breast fed and were not given supplemental vitamin D.
If patient is a vegetarian, evaluate if obtaining sufficient amounts of vitamin B12 and iron. Strict vegetarians may be at particular risk for vitamin B12 and iron deficiencies. Proper care should be taken when implementing vegetarian diets for pregnant women, infants, children, and the elderly. This care plan addresses general concern related to nutritional deficits for the hospital or home setting. Ascertain healthy body weight for age and height. Refer to a dietitian for complete nutrition assessment and methods for nutritional support. Experts like a dietician can determine nitrogen balance as a measure of the nutritional status of the patient. A negative nitrogen balance may mean protein malnutrition. The dietician can also determine the patient’s daily requirements of specific nutrients to promote sufficient nutritional intake. Set appropriate short-term and long-term goals. Patients may lose concern in addressing this dilemma without realistic short-term goals. Provide a pleasant environment. A pleasing atmosphere helps in decreasing stress and is more favorable to eating. Promote proper positioning. Elevating the head of bed 30 degrees aids in swallowing and reduces risk for aspiration with eating. Provide good oral hygiene and dentition. Oral hygiene has a positive effect on appetite and on the taste of food. Dentures need to be clean, fit comfortably, and be in the patient’s mouth to encourage eating. If patient lacks strength, schedule rest periods before meals and open packages and cut up food for patient. Nursing assistance with activities of daily living (ADLs) will conserve the patient’s energy for activities the patient values. Patients who take longer than one hour to complete a meal may require assistance. Provide companionship during mealtime. Attention to the social perspectives of eating is important in both hospital and home settings. Consider the use of seasoning for patients with changes in their sense of taste; if not contraindicated. Seasoning may improve the flavor of the foods and attract eating. Consider six small nutrient-dense meals instead of three larger meals daily to lessen the feeling of fullness. Eating small, frequent meals lessens the feeling of fullness and decreases the stimulus to vomit. For patients with physical impairments, refer to an occupational therapist for adaptive devices. Special devices may be provided by an expert that can help patients feed themselves. For patients with impaired swallowing, coordinate with a speech therapist for evaluation and instruction. Adjustments of the thickness and consistency of foods to improve nutritional intake may be provided by a speech therapist. Determine time of day when the patient’s appetite is at peak. Offer highest calorie meal at that time. Patients with liver disease often have their largest appetite at breakfast time. Encourage family members to bring food from home to the hospital. Patients with specific ethnic or religious preferences or restrictions may not consider foods from the hospital. Offer high protein supplements based on individual needs and capabilities. Such supplements can be used to increase calories and protein without conflict with voluntary food intake. Offer liquid energy supplements. Energy supplementation has been shown to produce weight gain and reduce falls in frail elderly living in the community. Discourage caffeinated or carbonated beverages. These beverages will decrease hunger and lead to early satiety. Keep a high index of suspicion of malnutrition as a causative factor in infections. Impaired immunity is a critical adjunct factor in malnutrition-associated infections in all age groups. Encourage exercise. Metabolism and utilization of nutrients are improved by activity. Consider the possible need for enteral or parenteral nutritional support with the patient, family, and caregiver, as appropriate. Nutritional support may be recommended for patients who are unable to maintain nutritional intake by the oral route. If gastrointestinal tract is functioning well, enteral tube feedings are indicated. For those who cannot tolerate enteral feedings, parenteral nutrition is recommended. Validate the patient’s feelings regarding the impact of current lifestyle, finances, and transportation on ability to obtain nutritious food. Validation lets the patient know that the nurse has heard and understands what was said, and it promotes the nurse-patient relationship. Once discharged, help the patient and family identify area to change that will make the greatest contribution to improved nutrition. Change is difficult. Multiple changes may be overwhelming. Adapt modification to their current practices. Accepting the patient’s or family’s preferences shows respect for their culture.